When will we see autonomous vehicles on our roads? The answer is that to some degree, they are already here. Numerous organisations are testing fully autonomous prototypes on public roads in the UK, and even commercially available vehicles already have several ‘quasi-autonomous’ features. KPMG has forecasted that the connected and autonomous vehicles market could be worth as much as £51 billion to the British economy by 2030 and could create some 30,000 new jobs over the same period. Accordingly, the UK and a number of other jurisdictions are already implementing legal reforms with a view to smoothing the path for this technology. Notably, Parliament has passed the Automated and Electric Vehicles Act 2018 dealing with the insurance of such vehicles, and changes are currently being made to the Road Vehicle (Construction and Use) Regulations 1986 and to the Highway Code to accommodate highly automated technologies. The government has also issued non-statutory guidance in relation to testing on public roads, and in relation to vehicle cybersecurity. 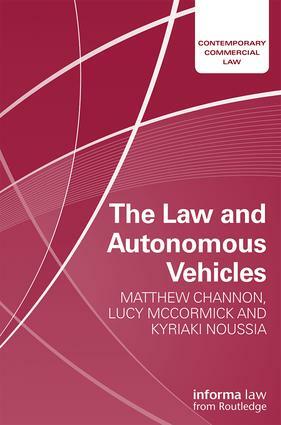 Against this rapidly changing landscape, this book analyses the key legal issues facing autonomous vehicles, including testing on public roads, insurance, product liability, and cyber security and data protection. It also examines the approach being taken in other jurisdictions, including Austria, Germany, Greece, Italy, the USA, and South Africa. Dr Matthew Channon is a Lecturer in Law at the University of Exeter. He presents both nationally and internationally on the law and autonomous vehicles and motor insurance law. Matthew was awarded with an Association Internationale de Droit des Assurances Academic Prize in 2016. He has carried out extensive research in the subject and has contributed to written consultation responses in relation to both the House of Commons and House of Lords. Lucy McCormick is a commercial barrister at Henderson Chambers. She undertakes a variety of product liability and property damage work, and lectures nationally and internationally on the legal issues arising from autonomous vehicles. Lucy was a finalist for the 2017 CogX Artificial Intelligence award for Industry Analysis. Dr Kyriaki Noussia is a Senior Lecturer in Law at the University of Exeter. She has expertise on law and technology including insurance and cyber security issues for autonomous vehicles. At the 2018 AIDA World Congress she co-chaired the plenary session on 'New Technologies: Autonomous Vehicles and Robots, Cyber Risks'. For academics and practitioners, this series offers cutting edge research titles and practical manuals on the whole spectrum of commercial law, and will be of great use to commercial practitioner across the range of specialisms. Our first title in this series is Causation in Insurance Contract Law, which will assist practitioners in ascertaining whether a particular loss or damage is covered in an insurance policy or in a tort claim.